The Costco Export Options and Costco Publish Options sections are unavailable (grayed out). Fixed the "Unexpected server response" error when incorrect credentials are supplied. Another quick compatibility fix - addresses the issue with creating new albums. Mac OS - fixed the issue with the Export Dialog not coming up and giving a "bad argument #3 to ? boolean expect, got table" error. Fixed the sign-in sequence following the recent change at Costco's backend. Associate Images: fixed the issue with matching files by name. Export Dialog: switching between export profiles now works correctly. Lightroom 6: the removal of person tags now works correctly when the Remove Person Info option is in effect. Fixed HTTP error 500 when the album name contains apostrophes. Users are required to re-authorize less frequently. NOTE: You may need to re-enter your credentials and save publish service settings and/or update your Costco export presets. Publish Service: fixed the issue with using global watermarks in album settings. Export Settings: added low/high pixel threshold options for automatic validation of the image size. Fixed issue: when the user enters an invalid username or password and the login attempt fails, the plugin won't display an error message. Publish Service: impreved performance of the album delete operation. New Album Dialog: Now you can apply the name of the currently selected folder or collection with a single click. Publish Service: Improved support for watermarks when Lightroom presets are stored with the catalog. Fixed the "Unexpected server response" error. Publish Service: New major feature - Reclaim Photos. 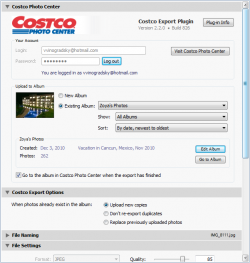 Now you can download your photos from Costco back to your computer and rebuild your publish service. Available to registered users only. Implemented the ability to upload photos in the original format without any additional resizing or processing (as long as they are already in JPEG or TIFF format). Implemented better default settings in Export and Publish dialogs. Fixed the "attempt to index global 'params' (a nil value)" error when re-exporting or deleting previously uploaded photos. Publish Service: Fixed the "? :0: attempt to compare string with number" error when using album-specific resolution settings. Resolved the issue with uploads after a recent change at Costco. Fixed: Create Album - the Apply Output Profile option remained disabled until the user selects the Resize to Fit checkbox. Publish Service - added pre-configured profiles with export settings for various standard print and canvas formats. Improved the handling of time-out errors when uploading very large files. Another compatibility update fixes the issue with consecutive uploads. This update restores service compatibility after a number of recent changes at Costco Photo Center. Fixed the issue with creating new albums. Implemented the License Deactivation feature so the plugin can be moved to another computer. Fixed the "You are currently not logged in, or your session with Costco has expired" error in some situations. Publish Service: Fixed a couple of issues with using per-album image settings. Increased the default timeout period from 30 seconds to 180 seconds to give the server more time to handle very large uploads (over 15 Mb). The plugin is now compatible with the recent changes implemented at Costco Photo Center. Publish Service: now "Associate Images" populates Costco Metadata fields correctly. Publish Service: the "Associate Images" dialog has been redesigned to fit 13" laptop screens. Publish Service: now "Check Photos" clears Piwigo Metadata fields if photos are no longer published through the Costco publishing service. 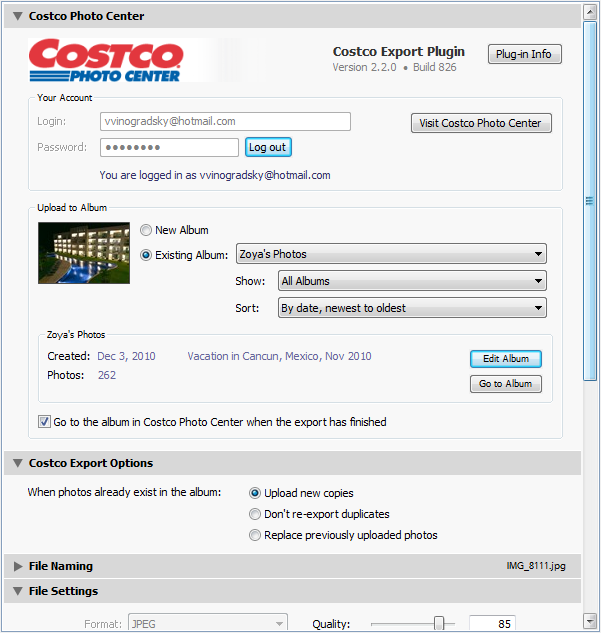 Publish Service: Now you can import existing online albums into the Costco Photo Center publish service. Publish Service: Added the ability to associate existing online photos with photos in the publish service. Publish Service: Added the ability to check the publication status for existing photos. Windows OS: Implemented a workaround for the intermittent "The handle is in the wrong state for the requested operation" error. Fixed the "Error parsing server response" error when creating new albums. Album Settings Dialog: the description field now resizes automatically so that it fills the available space as you resize the window. Implemented validation of file names. Remove the CostcoExport.lrdevplugin folder, then install the update using the new installation packages. Added TIFF support for the Image Format option. Added the "Album URL" metadata field to the "Costco Metadata" fieldset. This new field contains the album URL of the most recent upload for each photo. Fixed the "attempt to index a boolean value" error when renaming publish collections. Improved naming of plug-in specific metadata fields to make them easier to use in smart collection filters. Export dialog: minor visual improvements. Fixed the issue with republishing photos to albums containing only a single photo. Fixed the infinite loop when attempting to login with incorrect credentials. Increased the size album thumbnails in the Export dialog. Fixed the "Unexpected server response" error in some situations. Fixed issues with re-authenticating and resuming server session on subsequent uploads. Fixed the user authentication issue after a recent change on Costco's back-end. Fixed a couple of cosmetic issues with the Export dialog. Added metadata fields for keeping track of photos uploaded via the plug-in. These fields store the upload status, date and time of the latest upload, and the direct URL to access the exported photo at Costco. You can access these fields in library filters, view them in the metadata browser (as “Costco Metadata” tagset) and in smart collection filters. Improved error handling in situations when server connection can not be established. Fixed the issue with republishing when the album no longer exists in Costco Photo Center. Fixed the "attempt to index local 'clientMedia' (a nil value)" error when publishing photos using the "Custom Name - Sequence" renaming rule. Fixed issues with the "Go to Published Photo" functionality. The plug-in now prevents you from creating albums with a blank name. Added validation of the Image Sizing settings. The plug-in will issue a warning if the dimensions of rendered photos are outside of the 500 - 10000 pixels range. Fixed the "attempt to index local propertyTable" error. Fixed some compatibility issues with Lightroom 2. The plug-in is now compatible with Lightroom 3.3 for Windows and Mac OS. Re-designed layout of the Export dialog to provide room for album descriptions and better placement of album actions. Added the ability to use multiple user accounts via publish services or export presets. Added the ability to submit the debug log directly from the plug-in. Added support for Publish Services. Now the plug-in requires registration for unrestricted operation. Added an option to preview the selected album in the web browser. The version number format changed back to the classic form. For information, see version 1.12 release announcement. Fixed a rather weird issue with being unable to log in, which affected only some users. Fixed the issue with the export dialog layout, which was specific to Mac platforms only. Fixed the issue with a “Error code: 500, Unable to establish connection with the remote server” message popping up when the server connection has already been established. Mac users experienced an issue with album drop-downs hiding beyond the right side of the export dialog. In Lightroom 3 Beta, the photo lab logo is back. The plug-in is now compatible with Lightroom 3 Beta. Fixed the issue with some photos taking up to 5-10 minutes to appear in the target album after the export. User settings are now saved when you close the Export dialog. The plug-in no longer prompts you to login again on a subsequent export if you session is still alive. Added icons indicating plug-in state. Fixed the issue with the Export button remaining disabled until the album list is populated. Added the option to filter the albums list based on a data range. Added the option to sort the album list by album title or creation date. The plug-in now displays a thumbnail image for the selected album. Added a “Check for Updates” button, available in the Plugin Manager. Added the option to open the target album in the web browser once the export has been finished. The “Visit alloyphoto.com” button now works. Fixed a Mac specific issue with parsing XML response. Fixed the issue with not begin able to save presets. Fixed the issue with uploading photos to the wrong album after creating multiple new albums through the plug-in. Reduced clutter by relocating plug-in information and debug log controls to a dedicated section the Plug-in Manager. New albums are now placed at the top of the drop-down list for easy selection. This version includes changes from version 20090905.2, which was originally scheduled to be released after the Labor Day, but since some additional features had already been implemented, I decided to skip version. Implemented support for “Export with previous” to upload more photos to a previously selected album. Added dynamic querying of album information on the server to display the number of photos in the selected album and their total size. Improved session handling to eliminate the need to re-authenticate on subsequent export. Improved error handling when connection cannot be established. Better formatting of the debug log. Minor internal optimizations and code refactoring. The initial release of the plug-in. Oh thank you for much for this. Costcophotocenter.com is a pain to use after they “upgraded” it a while ago. it said “An Internal error has occurred. Access to undefined global: header”. It looks like the error is coming from a piece of code that “should never run”. This can only happen if the server response contains an unexpected status code. There is a couple of things to try – make sure you can successfully login with your credentials at http://www.costcophotocenter.com. Second, enable the debug log and email me the file CostcoExport.log file that will be created in “My Documents” folder – send it to alloyphoto@alloyphoto.com. First, thanks for this plugin!!! I am running Lightroom 2.5, Mac OSX 10.6, and version 20090907.3 of your plugin. I am unable to save a preset using the Costco Export I can save presets with other plugins. I receive no errors. When I look in the ~/Library/Application Support/Adobe/Lighroom/Export Presets, there is no preset. Any ideas? The just released version 20091004.4 includes a fix for this issue, among other fixes and improvements. Although LR3 is in Public Beta, any vision of making the Costco plug-in available for LR3? The current version generates an internal error on Mac OSX 10.6.1 with LR3 Beta. As soon as Adobe publishes the new SDK I am going to make my plugins compatible with LR3. Unfortunately, right now there is no information regarding API changes, not even an example of a working plugin. From what I understand, LR3 beta was released mainly to collect feedback from early adopters before the functionality is finalized. Also, they are probably not going to release the SDK before the retail release of LR3 hits the shelves. I’m having trouble connecting to Costco Photo, I get error code 500 cannot connect each time I try. I downloaded the update to my MAC but can’t seem to figure out how to get that download into my plug-in. Which file do I select to complete the download? Please send me a debug log as described in the troubleshooting section so I can see what could cause the issue. Next, launch Lightroom, open the export dialog and scroll down to the File Settings section, then click the Color Space box. Choose Other… from the drop-down list (at this point you can probably see only sRGB, AdobeRGB and ProPhoto RGB options there). The Choose Profiles dialog comes up. Here you can select additional color profiles to appear in the Custom Profile popup. Your Costco profile should be there. Select the check box next to it, then click OK to close the dialog. Now click the Color Space box again and select the added Costco profile. Once you are done configuring your export options, click Add under the Preset list, so your customized export settings are saved as a User Preset. Next time you export photos to Costco you won’t need to customize the settings, simply choose your Costco preset from the list. Please enable Format:Original for this plug-in. I sometimes need to upload JPEGs that are ready to upload (they are coming from InDesign and are proper size already) and they need/should not be re-compressed as JPEGs. Hi Thomas, good suggestion, thanks! Will add in the next update. Thank you for great customer service and support. The CVS plugin is working like a champ and i appreciate the lightening fast repsonse and fix!!!!!! Here is the link to the Costco Canada plug-in. Costco have recently implemented a number of changes on their back-end, which made the plug-in incompatible. I am currently working on an update. I have a new version which solves the issue with user authentication, I am currently e-mailing it out on a by-request basis. I expect it may have some related problems, however it restores the ability to authenticate and export photos. A new update should be available this weekend, so stay tuned. Hi, if possible, can you add TIF support? Thanks for the suggestion. Will add in the next update. Thanks! When do you think you'll have the next one up? I am hoping next week. Just out of curiosity, what would be the benefit of uploading TIFF vs JPEG? Was thinking there might be a benefit for large prints. Been researching the difference. I guess the only way to test it is to print a jpg and print a tif. Thank you for a great plugin. I have been able to successfully upload pictures to the Costco website using the plugin. However, I can no longer login to http://www.costcophotocenter.com. When I do so it takes me back to the login page. This happens with Internet Explorer or Chrome. Firefox however still works fine. I can also login to the Costco Photocenter on my other PCs (without Lightroom) using any browser without any problems. This only started happening after I used your plugin for the first time. I have tried clearing my browsing history/cache/etc completely, but that doesn't fix the problem. Has anyone experienced this issue before? Any ideas? Thank you again for a great plugin. This is really weird. The plugin has no way of affecting your browser – things happening inside your web browser and within Lightroom are completely isolated. I think this could be either a glitch at Costco Photocenter's servers, or the evil-doing of some Internet security software you may have installed. I have witnessed over and over again when such software can unexpectedly block or alter HTTP data streams. I bought the $15 version about an hour ago and haven't received the email with the code yet. How long does the email usually take? I received a bounce from yahoo because you misspelled your e-mail address. I have just re-sent to the correct address. Great Plugin. Nice to have the installer script now. I would like to request a feature – "canvas size". Currently Costco is oriented to printing the dozen standard page sizes, and to force cropping of non-conforming aspect ratios. Could you instead include a resize canvas for print option (Not resize image- resize canvas) with a radial check corresponding to the available print dimensions/aspect ratios (e.g. 2×3 aspect – for 4"x6" and 8"x12", 12"x18" etc). When exporting to Costco if you only wanted 4×6 prints what size should I change it to in the settings of the plugin to make the upload/export faster similar to their fast upload? It has to do with dimensions in pixels or doing long side etc. Typically you’d want to print at 240 DPI, so the numbers you are looking for can be calculated as (4×240) X (6×240) or 960×1440 px. Set JPEG quality level at 85% – that would give you a very good size-to-quality balance ratio. Everything looks great till I hit submit during activation. So far just a $15 headache. Please tell me i'm doing something wrong… I've tried submitting debug files but only get a unable to submit file not found meassage. How do I remove and reinstall it to lightroom 4? Could this help? You Rock! Although my issue was a flashplayer update problem(dumb dell!) the responsiveness on your part I feel went far above and beyond what one would expect for a program at this price point. For anyone thinking of purchacing this, Just Do It! It works great. Retrieving Albums… Any way to delete this action – it takes a very long time to get to the next step, and I always create new album. Sounds like you are using the Export feature. Try using the Publishing method instead. Just purchased and installed your Costco plugin. I am confused on one issue. I downloaded the ICC profile for my local Costco store. I copied it to the library folder as per your instructions. When I go to the "export" photo option in Lightroom 5 I can see each ICC profile I installed. (I am using an iMac w/OS X 10.8.5) I set up the publish option in LR5 with your plugin and during that set up I picked the glossy ICC profile for Costco. It uploads the album correctly to Costco. My question is this; when I initially set up the Costco Publish option in LR5 and selected the glossy ICC profile for that stores printer, will each photo that is upload or "published" from LR5 have that profile embedded? Also, how do you change the profile in the publish option to say the Satin ICC profile? When I look at the export features in LR5 with your plugin it looks pretty straight forward as far as picking the correct ICC profile for that particular export session. It's the publish part of your plugin I am a little confused on. Hope this makes sense? The profile you select in the publish settings will be the default profile applied to all published photos unless you specify a different profile in the album settings. Notice the “Use custom settings for this album” option when you create a new album (or edit the settings of an existing one). So, keep “glossy” as the global level and specify “satin” only for those albums that you want printed on satin paper. I just purchased and can't find a way to have it show up on Lightroom so that I can begin uploading to Costco. Help please? Please see the Installation Instructions and Using the Plugin links in your registration e-mail. You can also access that information from the sidebar on the plugin’s home page. does this tool allow me to export a book and print it as exported or I need to manage the book design at costco's website? I hope it is like blurb! Costco use their own software for designing books. There is no integration with Lightroom, as far as I know. The plugin supports color spaces. The optimal color space to use with Costco is the custom profile that one can download from Drycreek.com. The drycreek site suggests not embedding the profiles since they are large and some Fuji Frontiers will choke on them. If one chooses the drycreek profile, is it embedded in the upload, and what about rendering intents? Correct, the ICC profile is included in every rendered photo. They do add some bulk to image files, but in my opinion they are far from huge. I have never had any issues printing on Fuji printers. Make sure you select the profile matching the paper type (glossy / matte) that you will be actually printing on. The Costco Photocenter is back, and it looks like the plugin continues to work without any changes. Great news! Please note – all passwords have been reset. You must visit http://www.costcophotocenter.com and create a new password. #1 | Pinged by Costco plugin updated – alloyphoto about 10 years ago. #2 | Pinged by Costco plugin updated – alloyphoto about 10 years ago.